When to put your home on the market, and why timing is so important. Often, when we decide to sell our property, we simply engage an estate agent and then ask them to market it immediately. However, putting your house on the market at the wrong time of year for your particular buyers may mean that your property launch is more of a dribble. You need early and strong interest from buyers who want to move, and that takes a little planning. Newsflash – certain times of the year are better for selling particular properties than others. The key is to know your buyer and plan according to their timescale, not yours. Different types of buyers like to move at different times of the year, according to their own needs. 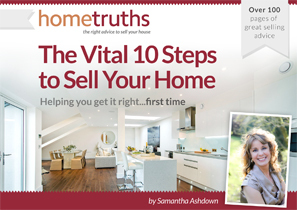 It’s not healthy for your eventual sale price, or for your emotional wellbeing, to have a property languishing on the market for months, so the better you can plan your launch, the more likelihood there is that your property will sell quickly. Young couples and singles: First time buyers often begin their first home search very early in the year. Perhaps they have spent one Christmas too many at home with their relatives, and realised it’s time to move out. Their search often starts in earnest in January and February, and their purchases at the lower end of the market – apartments and terraced homes – then supports the second and third time buyer market – semi-detached and detached homes. This, in turn, supports the larger properties, and so the cycle goes on. One thing to remember about young couples and singles, is that they tend to look at lots of different properties, and as they are not in a hurry, their search can go on for months, and even years. So be patient with them, and let them take their time to make up their minds. Families: Family buyers tend to buy at three distinct times of year: autumn, spring and early summer. Do you recognise the significance of these times? They are school term times. Buyers with children don’t usually like to house hunt during the holidays. First, they have better things to do, perhaps going on holiday, and second, it’s a whole lot more stressful viewing a home when you have a bored and whiny child to contend with. Mums and Dads tend to wait until the children are in school, so they can view the house in peace. Downsizers: Older couples and singles usually prefer to look at homes during the warmer months, so bungalows and retirement homes will often languish on the market over the winter time. The elderly don’t want to venture out to look at homes in the rain and snow, and nor do they want to move house in the winter time. For them, summer is the ideal time to sell, and to buy, and this type of buyer tends to look at fewer properties, and make their minds up more quickly. If you know who is most likely to buy your home, you can plan your launch to market more effectively. Remember that the less time your home is on the market, the closer to your asking price you are statistically likely to get, so plan for a quick sale! What to read next: When will my home sell?